Safety on our roads is a collective responsibility for all road users both pedestrians and motorist.This w eek on Security and Safety alerts on radio we will discuss a very important topic which will help reduce your risk of being involved in a crash as well as improve your personal safety and security as a motorist. 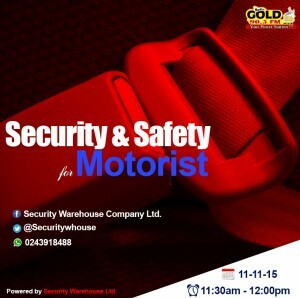 Our experts will be talking about Security and Safety for motorist. Cross streets at a corner, using traffic signals where available and crosswalks.